This oceanfront North Myrtle Beach resort has an indoor swimming pool, oceanfront swimming pool and a beautiful lawn with picnic tables. The accommodations at this North Myrtle Beach resort are terrific while the conveniences are plentiful. Ashworth is nicely located in the Ocean Drive section of North Myrtle Beach, South Carolina. It is just a block away from Main Street, which means it is within walking distance of shops, restaurants and even beach clubs where you can hear beach music and watch shag dancing. That is a quintessential North Myrtle Beach vacation experience and Ashworth makes it easy as can be. This North Myrtle Beach resort is an 18-story high-rise on the Atlantic Ocean where every North Myrtle Beach vacation rental inside has an oceanfront balcony. 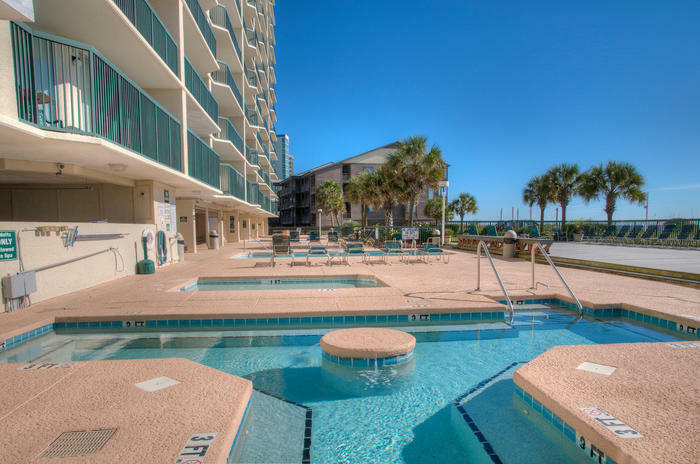 Imagine watching the beachfront from a top-floor North Myrtle Beach condo rental at Ashworth or watching the pool deck from a first floor North Myrtle Beach rental. There are dozens of North Myrtle Beach vacation rentals from which you can choose at this North Myrtle Beach resort. They are all spacious and beautifully decorated. Do you need a two-bedroom North Myrtle Beach condo or a three-bedroom, three-bath condo in North Myrtle Beach, SC or a four-bedroom retreat that accommodates up to one dozen people? Each of these North Myrtle Beach vacation rentals has a fully furnished kitchen, an oceanfront balcony and a comfortable living space. There are plenty of places to rest and relax and enjoy being on the oceanfront in North Myrtle Beach, South Carolina. Details inside these condos in North Myrtle Beach, SC include high-speed Internet access, a dishwasher in the kitchen, washer/dryer unit for your convenience and usually there is at least one DVD player in these North Myrtle Beach rentals. Your family will definitely be comfortable inside these North Myrtle Beach condominiums rentals. And outside at this North Myrtle Beach resort there is quite a bit in which you can immerse yourself that you will be equally entertained during your North Myrtle Beach vacation.